Amateur video shows air show crash Jump to media player Amateur footage shows a Hawker Hunter classic jet fighter crashing while taking part in an air show at Shoreham in West Sussex. 'Plane was too low, then huge explosion' Jump to media player A Hawker Hunter plane has crashed at Shoreham Air Show in West Sussex. 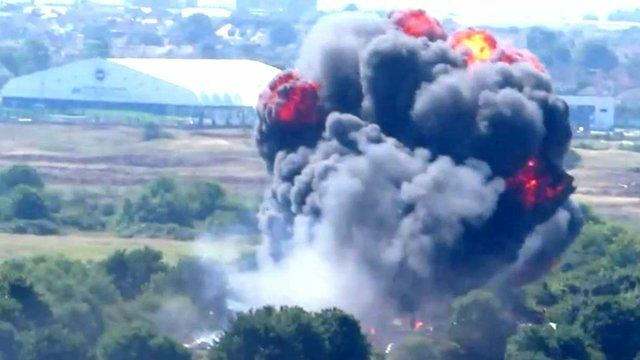 Amateur video shows how a Hawker Hunter plane crashed while taking part in an air display at Shoreham in West Sussex. Sussex Police said there were several casualties after the jet came down close to the main A27 dual carriageway, but could not give details on their condition. The plane is thought to have crashed into a number of vehicles. The A27 is likely to remain closed for several hours. Video footage courtesy of "Dan Tube".